Tilikum, the orca that killed a trainer at SeaWorld Orlando in 2010, has died, his owners have announced. SeaWorld said it was "deeply saddened" by the killer whale's death, saying Tilikum had suffered serious health issues but did not give a cause of death. He was estimated to be 36 years old and was born in waters off Iceland. Tilikum was featured in the documentary Blackfish, which criticised parks that keep killer whales in captivity. Trainer Dawn Brancheau died after Tilikum dragged her underwater by her hair and repeatedly struck her, as she performed with the whale in front of an audience. The investigation into her death ruled that Brancheau died from drowning and traumatic injuries. Tilikum had also been linked to two other deaths, which were detailed in the Blackfish documentary. In 1991, while being kept at another park in Canada, Tilikum and two other whales had prevented a trainer from leaving their tank after she fell in, an inquest ruled. Tilikum was then transferred to SeaWorld Orlando, where, in 1999, a man sneaked into the park at night and was found dead alongside the whale the next day. An inquest ruled that the 27-year-old had died of hypothermia, but officials also said it appeared Tilikum had bitten the man and torn off his trunks. Tilikum was SeaWorld's most prolific male orca, siring 14 calves while he was at SeaWorld Orlando - even though there were fears that aggressive traits could be hereditary. The company announced an end to its breeding programme in March 2016. "While today is a difficult day for the SeaWorld family, it's important to remember that Tilikum lived a long and enriching life while at SeaWorld," SeaWorld wrote in Friday's statement. It continued: "Tilikum's life will always be inextricably connected with the loss of our dear friend and colleague, Dawn Brancheau. While we all experienced profound sadness about that loss, we continued to offer Tilikum the best care possible." Others, however, disputed SeaWorld's version of a "long and enriching life". The CEO of the Humane Society of the United States, Wayne Pacelle, said Tilikum was "caught up for decades in the old business model of captive orcas on display", but expressed hope that "the era of keeping these great animals in captivity will actually end." People for the Ethical Treatment of Animals (Peta) said on social media that the orca had died "after three decades of misery". "It's no wonder Tilikum succumbed to mental illness under such conditions, and then finally, to incurable physical illness," the group said. Blackfish, a 2013 US documentary, was widely acclaimed for its investigation into orcas in captivity. It argued that life in tanks makes them more aggressive towards humans and each other. New safety rules were introduced after Brancheau's death: Trainers could no longer enter the water to perform tricks with the whales. But it was not until 2016 that SeaWorld Entertainment officials announced that the tourist attraction would end its orca breeding programme and theatrical shows involving killer whales. SeaWorld did not take part in the Blackfish documentary. 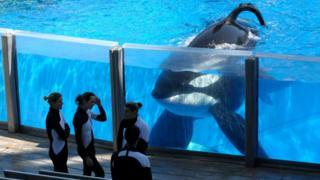 After it was released, attendances at SeaWorld fell, as did the company's share price. Last year, a SeaWorld representative told the BBC that "[Brancheau's death] was not an attack, this was a terrible accident".